Rebuild Cleveland: How much house will $1,000,000 buy you? How much house will $1,000,000 buy you? 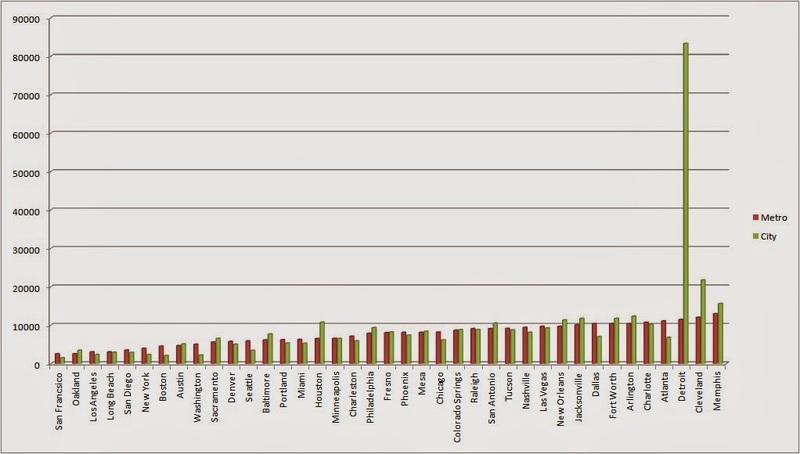 Recently, a blog article on Zillow.com published a uniquely shaped chart illustrating how far your dollar goes in each of the top 40 major markets, pictured to the right. The full text of the article may be found here. The cities in this chart can be categorized and split into three general categories: the coastal cities (San Francisco-Seattle), "middle America" (Denver-Cleveland) and Detroit. Arguably, the two second-bottom cities, Memphis and Cleveland, tend to break away from the "rest of America" trend--$1mm might buy you four Denver-size houses in Cleveland, which is a bit of a contrast. But the graph does illustrate a concept that I've been espousing for years: Cleveland and Detroit are utterly incomparable when it comes to discussing urban decline and poverty. We don't shut the streetlights off or fail to respond to fires in the City of Cleveland. We're functional and they're dysfunctional. It's so infuriating that we ought to have a law on the books that makes Cleveland-to-Detroit comparison a misdemeanor. I don't mean to jump on the dump-on-Detroit bandwagon because I think they've got their hands full over there with detractors. There are many other cities and parts of the country out there that are far more worthy of criticism, such as Washington, D.C., or the entire state of Florida. Detroit's shortcomings are obvious, and they're working on fixing them. There are other parts of the country that people seem to accept unquestioningly as "a nice place to live" or a "booming metropolis" despite the cracks beginning to appear in their foundations (see also, Chicago's looming financial crisis). I digress. Back to the chart. Important to note here is the fatal flaw of many statistical city comparisons, especially those Forbes city comparisons (remember who won "America's Most Miserable City" a few times while its suburbs continually win "best places to live in the US" awards). How can the best place to live in the United States be located just four miles from the worst place to live in the US? Focusing on the Greater Cleveland area, the population generally regards the center city as an undesirable address, and prefer the more substantial city services, perceptions of lower crime, and the feeling of community that its 53+ incorporated suburbs offers. The city has a "donut hole" of poverty surrounding the relatively robust central business district, and the overwhelming majority of those 300,000 souls who work downtown live beyond the donut, 6 or more miles from the city center. Unfair as the comparison may be, I'll point out anyway that this "donut hole," "inner-city dilapidation," "concentration of poverty," or whatever you may want to call this phenomenon, is the very problem that is holding the metro area back from becoming the next Chicago, or, ahem, Pittsburgh, or wherever the next media darling "Best Place to Live in America" might be. Nonetheless, it is still useful to compare apples-to-apples data. Some of the cities in this list contain nearly their entire metro areas, like Las Vegas, Charlotte, Denver, or Seattle. These cities became established major cities at a time when annexation of surrounding land was popular, and do not have nearly as elaborate of a suburb structure like Cleveland or Pittsburgh does. Local politics are kept to a low roar in the former cities, and the populated area is able to grow and plan in a more cohesive manner rather than in fits and starts involving kickbacks and "anti-poaching" deals like what happens here at home all the time. So, to satisfy my curiosity, I reorganized the data by metro area. According to the original blog article, the city data was sourced from Zillow and Movoto, so I decided to use Zillow to source metro area per-square-foot area. In cases where Zillow did not display metro area data, like Austin, I assumed that an average home was 1,500 square feet and used the median home sale price to calculate a dollars-per-square-foot price. The results do not make the Detroit metro area look nearly as bad as the above graph, so kudos to them! Note in this configuration of data, Memphis actually clocks in last (or first, depending on how you view it), and Detroit is more expensive than Cleveland. Note that some cities in these rankings are actually in the same metro area (Phoenix and Mesa, Dallas, Fort Worth and Arlington, etc) and will have the same numbers, appearing to create plateaus in the data. In any case, $1 million for a 12,000 square foot house in Cleveland ($83/sqft) appears to be a lot more reasonable than 21,000 square feet ($46). See what $1.65 million will buy you if you're in the right place in the right time in the outer suburbs (exurbs?). Pool maintenance is a major PITA, but at least you've got room to store the tools in the 14-car garage. I took the liberty of comparing my metro-area dataset with the original data in the graph below. Note that Detroit, as we probably expected, is off the charts while most other cities are roughly equally expensive between city and metro. Interestingly enough, it's far more expensive to live in Dallas or Atlanta cities proper than the suburbs, which probably can be accounted for by less stringent building standards in the outlying unincorporated regions, which are very far away from the city center. To recap, the lesson to be learned here is not to arbitrarily stop an examination of two cities at the city borders. Given that less than a third of the population of Cuyahoga County calls Cleveland home, it's especially important when comparing Northeast Ohio with other regions. All we have to do is merge the city and county, and Cleveland is the 9th largest city in the country!